Discovering and then learning the Dorn Method has been a true blessing in my life and my aim is not only to help people in my own practice, but also to help promote and teach Dorn and to spread this wonderful therapy as far and wide as possible. Having trained well over 500 therapists to date, the Dorn Method is now getting out there and helping a lot of people who look for gentle re-alignment of their body structure. I am an Advanced Dorn Method Practitioner/Authorised Instructor and founder of the UK Dorn Method Centre and Dorn Haus Back Pain Therapy Centre in Stratford upon Avon. I am also proud to hold the title of The Federation of Holistic Therapists prestigious Highly Commended Tutor of the year award for 2015. I want to help people feel better quickly and to help them stay out of pain over the long term. I do this by combining the simple but clever Dorn Method principles and techniques with regular maintenance and teaching of easy to learn self-help exercises so my clients can also look after themselves. I find most of my clients therefore need very few therapy sessions before feeling much better. I studied the Dorn Method over 14 years ago back in my native country of Germany, where I had the privilege to be taught and trained by Dieter Dorn himself and other wonderful teachers such as Hildegard Steinhauser and Thomas Zudrell. I am also a fully qualified complementary therapist in Body Massage, Reflexology, Aromatherapy and Indian Head Massage and a member of the Federation of Holistic Therapists (FHT). 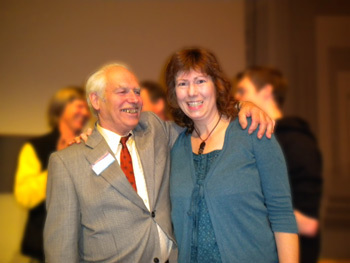 I am also a founder member of the Dorn Method Therapists Association (DMTA) in the UK. I believe The Dorn Method should a be a part of every Therapist's toolbox, in fact I also hope one day to see orthodox medicine adopting this wonderful therapy as I believe it could have a huge postiive impact on organisations such as the NHS and be of great benefit to so many.